1977 Topps Star Wars Series 3 proved just how popular Luke Skywalker, Darth Vader, Han Solo and company were. The yellow-bordered cards continued on from the first two sets, keeping much of the same set structure. 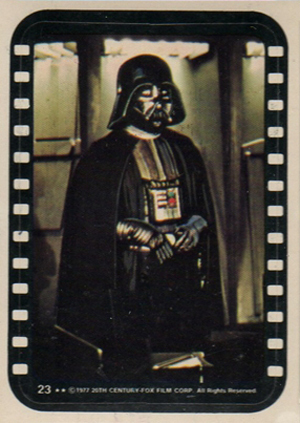 1977 Topps Star Wars Series 3 has another 66 base cards. Running from number 133 to 198, images are stills taken from the film. The layout sticks with the same design used in the first two series, only with the bright yellow borders. An exploding Star Wars logo at the bottom of the card also has the card number. Next to it is a caption written in red. Card backs are split between puzzles and 22 descriptions. These descriptions come together to make a mini Star Wars encyclopedia, detailing different aliens, ships and other items from the franchise's early mythology. 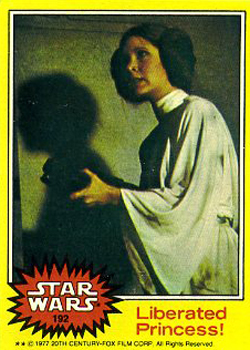 The biggest change for 1977 Topps Star Wars Series 3 came with the stickers. While they still fall one per pack, the design changed from a space backdrop to one that resembles a film strip. Numbering for the 11 stickers expand the existing checklist, running from numbers 23 to 33.
i remember my father and i collecting these a long time ago. oh, such comfort! !